Choose clever birthday quotes by celebrities made cleverer and more personal by original birthday wishes (written by me) for the ones you love. You'll only find this great combo right here. Why have I decided to add personal birthday wishes to the clever quotes on this page? Clever birthday sayings, on their own, are great for brainiacs but they lack the heartwarming side of birthday messages, which is key to making birthday boy or girl feel super special. But the clever side of any quote matters too. The right pick for that special someone celebrating a birthday is a clever saying with a message that brings him or her meaning and purpose in life (it shouldn't just be a brain teaser). Need some help with your search? Take a moment to read Message Guy Tip #21. "Middle age is youth without levity, and age without decay." Embrace your middle age and the youth that comes with it. Happy birthday! "Life would be infinitely happier if we could only be born at the age of eighty and gradually approach 18." You make it happen for real...just with your amazing attitude. Happy birthday! "As long as any adult thinks that he, like the parents and teachers of old, can become introspective, invoking his own youth to understand the youth before him, he is lost." Good advice. The peace of mind we earn as we grow older is better than anything our youth can tell us. It's done great for you. Happy birthday! You should always look at the big picture. If you look forward with the right eyes, you'll quickly see how to live out your days in happiness! Happy birthday! Once again, it can be said that age does not matter. 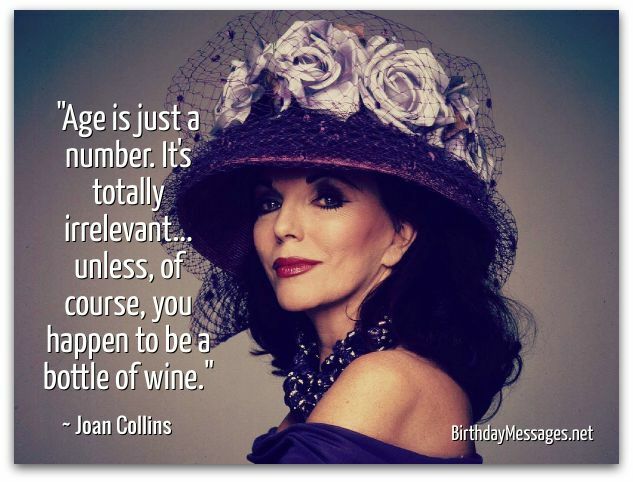 No matter how you look at getting older, I think you're simply priceless...just like vintage wine! Happy birthday! Let's enjoy this time of life together. Happy birthday! "Each age, it is found, must write its own books; or rather, each generation for the next succeeding." Every new chapter you write is simply beautiful...just like you. Happy birthday! I think this applies to women, too! You're one of the best, darling. You've only gotten better (at everything). Happy birthday! Your nest egg isn't the only way to enjoy retirement. At 18, you're an adult, so you're old enough to tell you: stay in school and get a degree. Age is all about your attitude. I hope I have your incredible attitude at your age. You inspire me. Happy birthday! "Why should society feel responsible only for the education of children, and not for the education of all adults of every age?" You're the oldest (and youngest at heart) student of life. 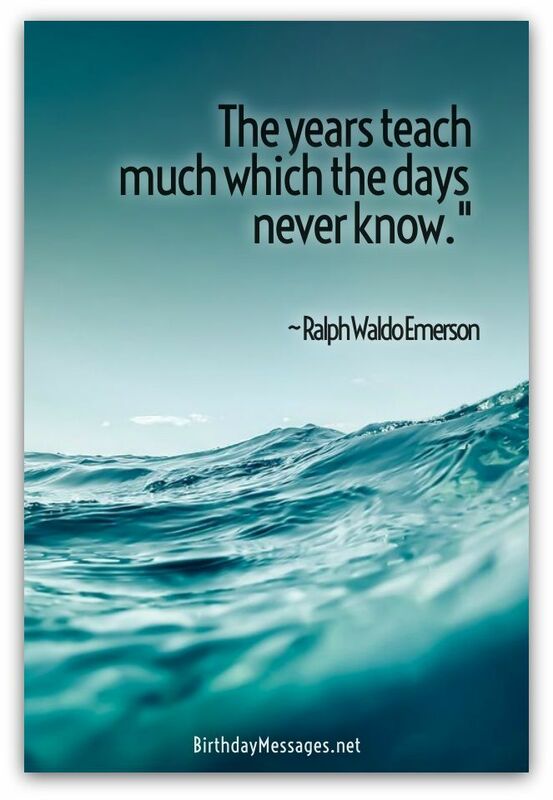 Keep learning! Happy birthday! You never hesitate in the face of risk. That's why you're so young at heart. Happy birthday! So I guess your happy inner child makes you a genius (and super young in spirit). Keep your youth IQ up. Happy birthday! "Age is not important, unless you're cheese." This is slice-of-life advice I can live by. You, too! Happy birthday! ...You need to see these qualities in the saying: originality, inventiveness, brilliance (in terms of the idea), nimbleness with words, mental dexterity and practical ingenuity and quick-wittiness. That's what makes the best clever birthday quotes. Sound difficult? It's a good thing there are many clever ones (already written for you) right here. 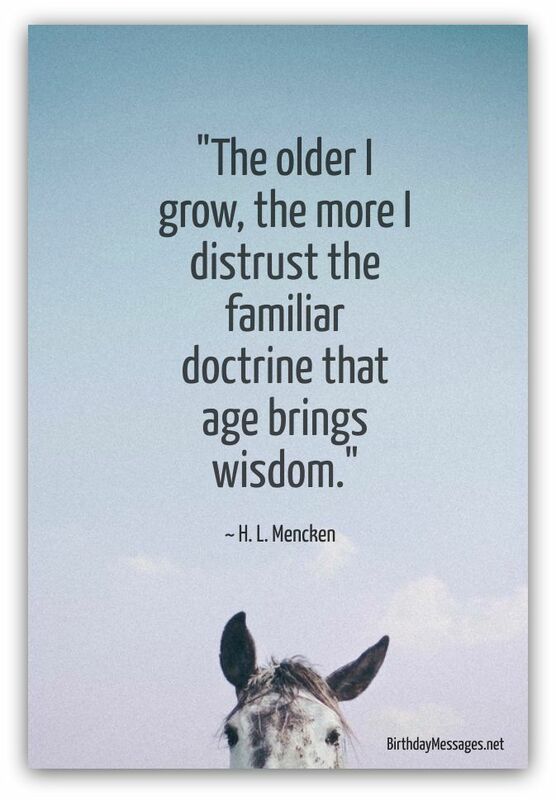 "The older I grow,the more I distrust the familiar doctrine that age brings wisdom." Let's be unwise (at least on your special day) and celebrate your birthday with abandon. Have a happy one! Let's get into the spirit of things. "He who has not the spirit of this age has all the misery of it." Let's also get into the spirits (a few shots never hurt anyone). Let's party! Happy birthday! "I grabbed a pile of dust, and holding it up, foolishly asked for as many birthdays as the grains of dust, I forgot to ask that they be years of youth." Just pretend you made this birthday wish and stay young forever!